The first new state-of-the-art London Overground train built by Derby’s Bombardier has been unveiled. The trains are being built at Bombardier Transport’s UK site in Derby where 120 local engineering staff have worked on the design and testing of the trains. A further 170 staff have been working on manufacturing the trains, with 50 per cent of these recruited specifically to fulfil this contract. Twenty apprentices have worked on the production of the trains. Around 50 per cent of the supply chain was with UK suppliers and worth £56m, indirectly supporting further jobs across the country. The new trains will carry almost 700 people per train and feature a high capacity walk- through layout, Wi-Fi and USB charging points and a brand new seat moquette. Hosting a range of new features, the first of the new trains will be in passenger service by November. The new features of the ‘Class 710’ trains include the latest intelligent lighting and temperature control for more comfortable journeys, as well as Wi-Fi, USB charging points and digital information screens giving customers higher quality real time travel information while on board. In total, a fleet of 54 new air-conditioned trains will transform journeys for thousands. 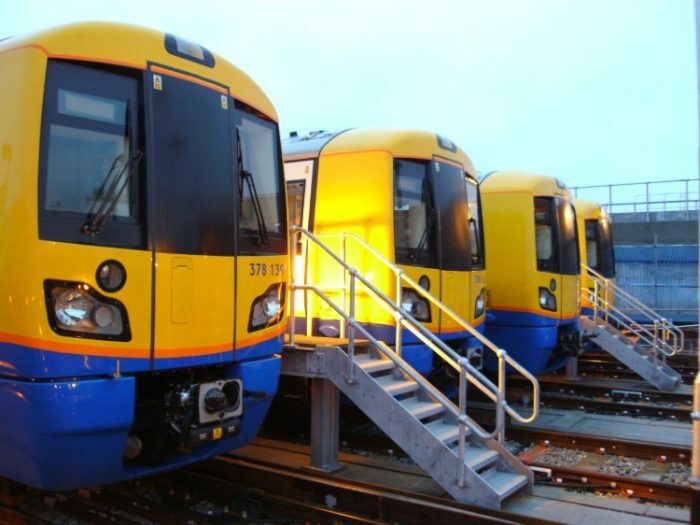 Jonathan Fox, TfL’s Director of Rail and Sponsored Services, said: “Our new state-of-the-art British built London Overground trains will be an exciting addition to London’s transport network and help boost capacity on some of the most busy and popular lines. “We are very keen to see them introduced into service as soon as possible so our patient customers can benefit from the fully air-conditioned, walk-through trains with handy USB charging points and real-time passenger information screens. “Over the summer, the new trains will undergo final rigorous testing and drivers will complete extensive training. We are now planning for the first trains to enter passenger service on the Gospel Oak to Barking route by November.